The Not Wedding is almost here! If you haven’t bought your tickets yet for this fabulous event on Thursday, July 21, then get on it by clicking on The Not Wedding’s website! 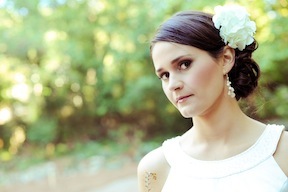 The Not Wedding is proud to showcase the talents of Claudia Mejerle. She’s a true artist, posh stylist, and beautification extraordinaire who will be handling the bridal makeup at The Not Wedding. 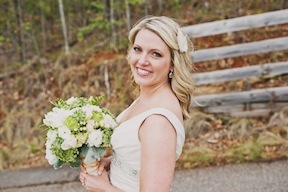 PrettySouthern was pleased to catch up with Claudia about her business as a wedding vendor…and her definition of Southern beauty is oh-so-sweet. Hmmm…it’s kind of hard to say. I have been doing makeup for as long as I can remember, so I am not really sure when to say it actually became a business. I suppose my first real paying customers came in 2007 for bridal makeup. It wasn’t until the beginning of 2011 that I took the leap to do makeup full time. Best decision of my life. What was your inspiration for creating this wedding venture? Well, there wasn’t ever a specific moment when I said, “I am starting a business.” It has just kind of evolved. I have always enjoyed doing makeup for friends and over time I started getting referrals to do makeup for weddings. My hobby just turned into a business and I figured if I could make a living doing something I love, I just had to go for it. I just love weddings and the excitement and beauty around them and I love getting to be a part of that. Even though I now do makeup for a variety of clients and projects, weddings are very special to me because that is what really launched my business. How long have you provided your wedding service? For the past four years, I have done makeup for weddings as somewhat of a “side job”. I just loved it too much to not give it my whole heart, so in early 2011, I decided to follow my dream of being a makeup artist full time, and have continued to focus on bridal makeup since. Why are you excited about working with The Not Wedding? I am beyond thrilled to be a part of The NotWedding because, well, weddings are one of my very favorite things, and there is no doubt that this one is going to be faaabulous. I’m so looking forward to the chance to work with other talented, creative folks who love what they do and who also offer a service that enhances weddings in a unique way. 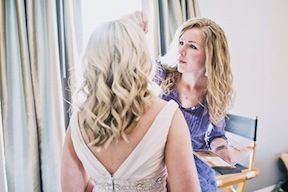 I am particularly looking forward to doing makeup for The NotWedding bridal party as an opportunity to show how makeup can be used to enhance a woman’s natural beauty for a tremendously special occasion. What’s your favorite part about Southern weddings? The food, of course! But really, one thing that I love most about the Southern weddings I have been a part of or attended is how the bride and groom’s personality is reflected in many of the details of the wedding. A lot of people have started to steer away from tradition and have taken creative liberty to make their wedding their own. Weddings are beautiful anyways, but when the couple’s story and personality is seen in everything from the invitations to the getaway car, the experience is much more special for everyone. And in regards to the bride specifically, I love that you see her personality in not only her dress, but also her makeup. This detail is subtle but so important. Through makeup, I am able to enhance a woman’s natural beauty, so that she still looks like herself—her most beautiful self. It’s not about making her look like someone else. It’s about focusing on her natural beauty and focusing on what makes her unique. What are some of the prettiest, craziest or funniest and most touching moments you’ve witnessed at a Southern wedding? One of the funniest moments I have witnessed at a wedding was actually recently at one of my best friend’s wedding. I love how this particular couple really plays off each other and brings out each other’s personality. And they did just that during an impromptu “dance off” to “The Devil Went Down To Georgia.“ They acted out the song lyrics, lip-synced and did a little do-si-do dancing throughout the entire song. Everyone circled around them and clapped to the beat of the song. It was hysterical how their dancing appeared to be completely choreographed even though it wasn’t in the slightest. I would define the quintessential Southerner in the 21st century with a list of positive adjectives: kind, warm, welcoming, polite, humble and generous. Even though the term “southern hospitality” may be a cliché and the label “southern gentleman” may be a common stereotype, I would say these words are pretty accurate in illustrating a true Southerner. How would you describe a lady? How would you describe a gentleman? Are their inherent qualities similar? To me, a lady is delicate, feminine and kind. A gentleman is chivalrous, masculine and a leader. While I feel that ladies and gentleman have separate roles, particularly in relationships, I do feel that there is overlap in that they both offer strength, but also have a softer, gentle side. Where is the best location you’ve seen a Southern wedding and/or reception? The beauty of some friends’ wedding and reception location recently blew me away. The event was held at the home of the bride’s parents, on a mountaintop in northeast Georgia. The setting was phenomenal—surrounded by woods and a view of the mountains. The bride’s landscape architect father cleared a section of their property that overlooks the mountains and created a tiered lawn for the wedding ceremony. It was absolutely breathtaking—not only because it was obviously beautiful, but also because location has meaning to their family. I love when a wedding/reception takes place at a location that has some sort of significance to the couple, especially when it is one of the family’s homes. For more information on Claudia’s beautiful style, please visit her website and her blog. Claudia is as sweet as she is talented! We just love her. Can’t wait to see her work her magic at The NotWedding. Claudia did my bridal makeup and it was AWESOME! She’s a true talent, and a dream to work with. Most brides will end up with a new best friend after working with sweet, Claudia!